Militaria Dress sword stick for the Royal Malta Militia. White metal pommel on superb blonde full length high ridge Malacca. 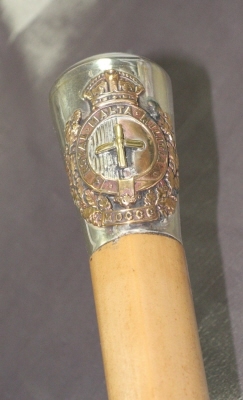 The cane finished with the original base metal ferrule. The broad blade housed in the shaft, and removed with a pull action from the lower shaft. The broad blade in good condition without breaks, cracks or reduction. Lovely condition that has evidently been cherished. Should you wish to purchase this cane, please contact us by telephone or email.